Pretty ceramic lustre butterfly, measuring 4 cm/40 mm wingspan.Teamed with seed and oval Heamatite beads (2mm, 5mm, 10mm). The necklace is 17.5 inches/44 cm in length. Silver plated toggle fastener. The matched earrings, lustre butterflies measure 2cm/20mm wingspan.Teamed with seed and oval Heamatite beads (2mm, 5mm). The earrings are 7.5 cm/75mm in length. Sterling 925 Silver (hallmarked). Versatile longer length necklace with matching earrings. The textured silver flat beads measure 1.2 cm/12 mm combined with 2 mm seed and 2 cm/20 mm oval Haematite beads. It is approx. 37 inches/94 cm in length. Hook fastener. It can be worn doubled-up to achieve various looks. PLUS - this does also make a great multi-wrap bracelet! Earrings measure 5.3 cm/53 mm. Hooks for pierced ears. Silver plate. Classic design necklace and earring set. The textured silver square (flattish) beads measure 1.7 cm/1 7mm and the silver spheres measure 1.1 cm/11 mm, combined with 2 mm seed and 1.2 cm/12 mm twisted Haematite beads. It is approx. 21 inches/54 cm in length. Hook fastener. The earrings measure 6 cm/60 mm. Hooks for pierced ears. Silver plate. Versatile longer length necklace. The textured matt burnished copper 'mis-shapen' ovals (flat) measure 1.6cm/16mm combined with 2mm seed and 8mm hexagonal Hematite beads. It is approx. 37 inches/94cm in length. Hook fastener. It can be worn doubled-up to achieve various looks. The earrings in oxidised copper plate measure 5.5cm/55mm in length. Versatile longer length necklace. 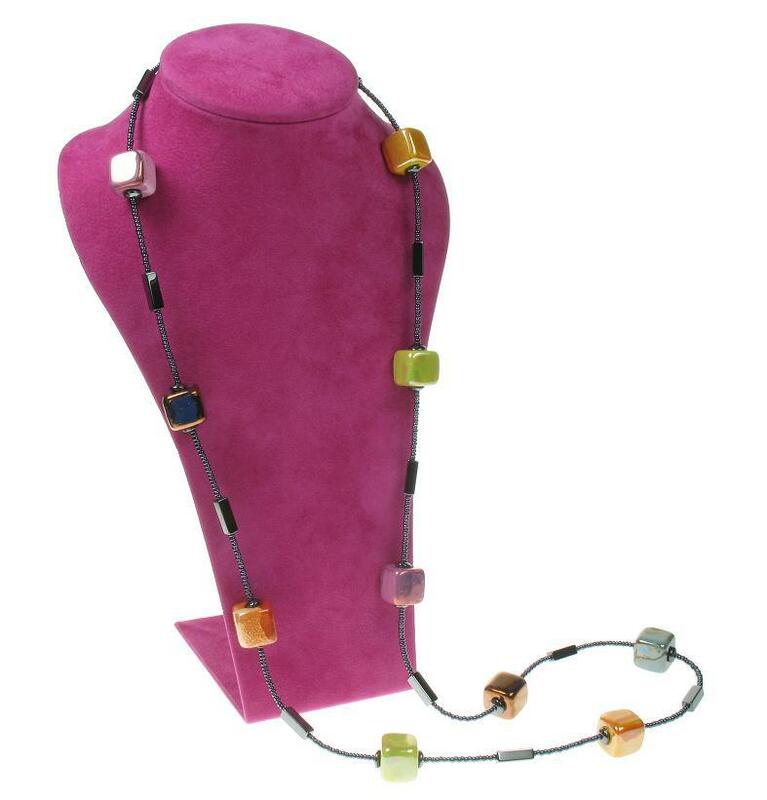 The colourful hand crafted ceramic cubes (green, blue, bronze, pink, orange) measure 1.2cm/12mm combined with 2mm seed and 1.2cm/12mm oblong Hematite beads. It is approx. 37 inches/94cm in length. Hook fastener. It can be worn doubled-up to achieve various looks. Pretty hand made glass 'lampwork' puffed heart pendants. They measure approx. 3.5cm/35mm. Teamed with 2mm Heamatite seed beads and 6mm ovals. (2mm, 7mm). The necklace is 18 inches/46cm in length. Toggle fastener. Silver plated. Beautiful duo pendant. Black and white Moretti glass beads. Pendant measures 5cm/50mm total length x 1.5cm/15mm max. width. Swarovski crystal bi-cones in milky opal, jet black, black diamond and clear (4mm, 6mm). THIS ITEM IS NOT SUPPLIED WITH A CHAIN. Beautiful trio pendant. In Azure and aqua blues Moretti glass beads. Pendant measures approx. 6.5cm/65mm total length x 1.5cm/15mm max. width. Swarovski crystal cubes and bi-cones in capri blue, blue zircon, Pacific opal and clear (4mm, 5mm, 6mm & 8mm). OOAK. THIS IS NOT SUPPLIED WITH A CHAIN. Beautiful duo pendant with raised rose florals and polka dots. Turquoise, Ivory & pink Moretti glass beads. Pendant measures 5cm/50mm total length x 1.5cm/15mm max. width. Swarovski crystal bicones in cerise pink, pink alabaster, rose pink, peridot green and aquamarine (4mm, 6mm). THIS ITEM IS NOT SUPPLIED WITH A CHAIN. Beautiful duo pendant with raised and melted-in rose florals. White, green and apricot Moretti glass beads. Pendant measures 6.5cm/65mm total length x 1.5cm/15mm max. width. Swarovski crystal bicones in jonquil yellow, peridot green, peach and clear. Swarovski butterflies(8mm) and a flower (1cm/10mm). THIS IS NOT SUPPLIED WITH A CHAIN.